Jon, Nick and myself played at Cat Hollow Today. I got a couple of birdies on holes 3 and 18. 18 is especially tough. There is a row of trees that block easy access to the basket. 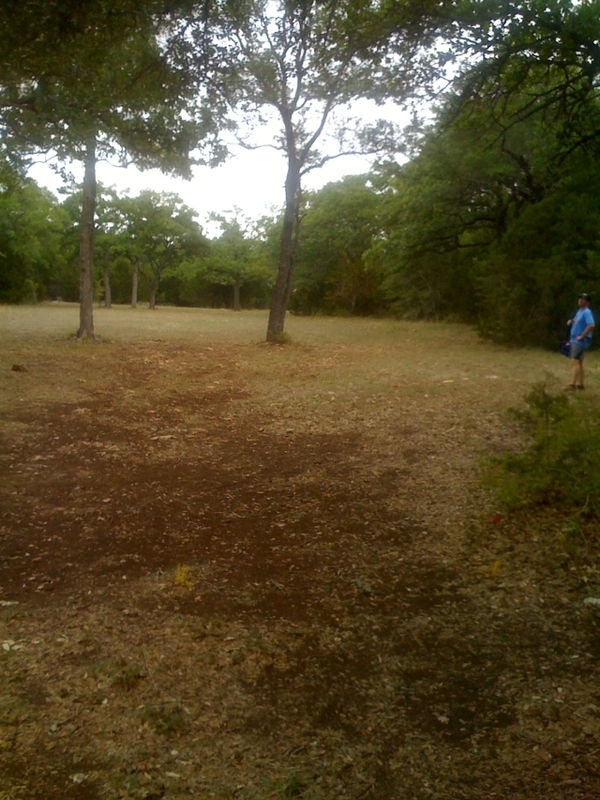 You have to throw a high hyzer to the right and up and over the trees. And, if you make it over them, it would then fall back to the left land close to the basket. Or, at least, that is the plan. This time it both made it over the trees and landed close enough for a birdie! 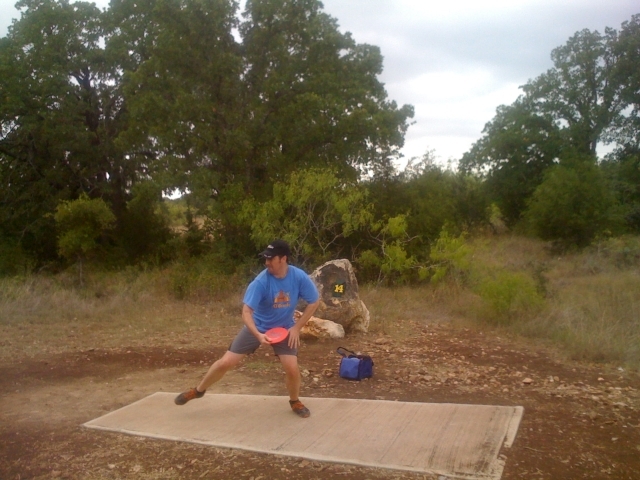 This entry was posted in Disc Golf on September 27, 2008 by Mark. First up on the table was Galaxy Trucker. I like this game. It is thematic. And both parts of the game are fun for me. The tension building your ship while competing with everyone else for the same parts. And the tension of trying to stay alive during the delivery run. The events can be brutal. You just might loose large chunks of your space ship. We kept within the Science Fiction theme tonight and played Race For the Galaxy. My cards eventually fit into a clear strategy: build and score developments. I was also able to set up a trading chain which netted me seven or so cards every other turn. But I knew I had to end the game early. I didn’t want the others to catch up to me. Fortunately, I was able to do so and win the game. This entry was posted in Gaming on September 25, 2008 by Mark. Here is yet another loaner car. Which I have had my fill of recently. What with the two separate replace the header gasket incidents recently. 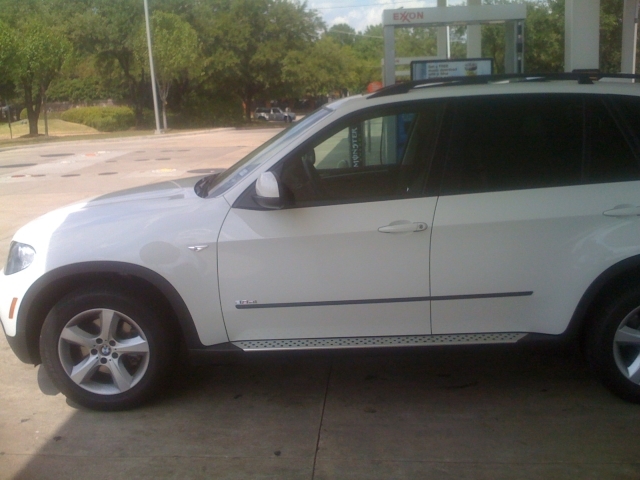 This time I am driving a BMW X-5. When I bought the car, part of the deal was replacing the car’s chip with a performance upgrade. Apparently, they couldn’t just install it before I bought it. I had to first buy the car, then drive it off the lot, and then come back in to have it upgraded. Whatever. Bureaucracy or State Laws at their finest, I guess. Back to the car, or SUV. Sesh, it is a pig. Big, heavy, extremely slow. I don’t know why people would buy cars like these. Sure, its roomy. But it is underpowered and a gas guzzler. This entry was posted in Interesting on September 24, 2008 by Mark. This is the first time I have had all seven doubles in my hand! I was the first to bid and I automatically called plunge (a convention meaning that you have four or more doubles in your hand and one of them is the six/six). Unfortunately, this was the wrong thing to do. The score was six to two and we were winning. The last player on the other team raised my bid to four marks. Which won the bid. And he also made me completely irrelevant by calling “doubles are a suit of their own”. yet you can just up the bid and try for a lucky chance. Like, for instance, that you partner holds the bone, or bones, that will stop you (this being a 1 in 3 chance). One time I blind plunged. My partner hears this and raises the bid. He has the other three doubles and a punt (a bone that is not under one of his doubles). This was an automatic four point swing. With the game being the first to seven points, that is a huge jump. This entry was posted in 42 on September 24, 2008 by Mark. 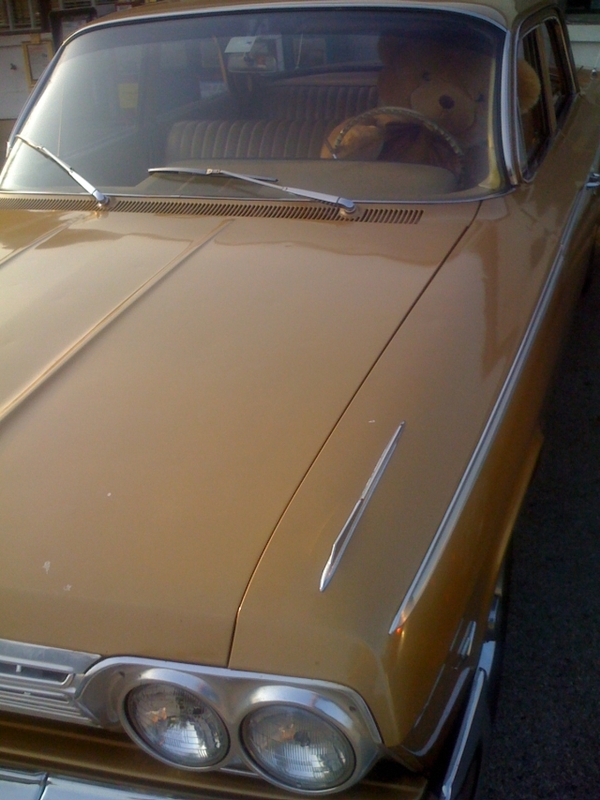 I saw this car parked at the Monument Cafe this morning with a huge Teddy Bear sitting in the driver’s seat. The colors matched as well. How cute! This entry was posted in Interesting on September 21, 2008 by Mark. 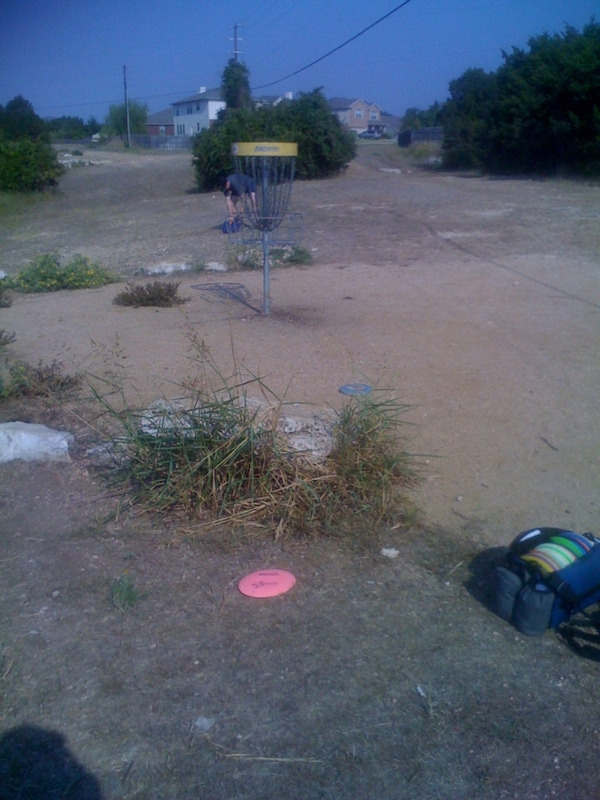 Mike, Jon, and I went out to the Brenbrook subdivision to play disc golf at the new course. This was our second time out there. I drove us out there in my BMW X5 loaner car. The directions that the iPhone gave us was a little squirrelly. But we made it to the proper location. 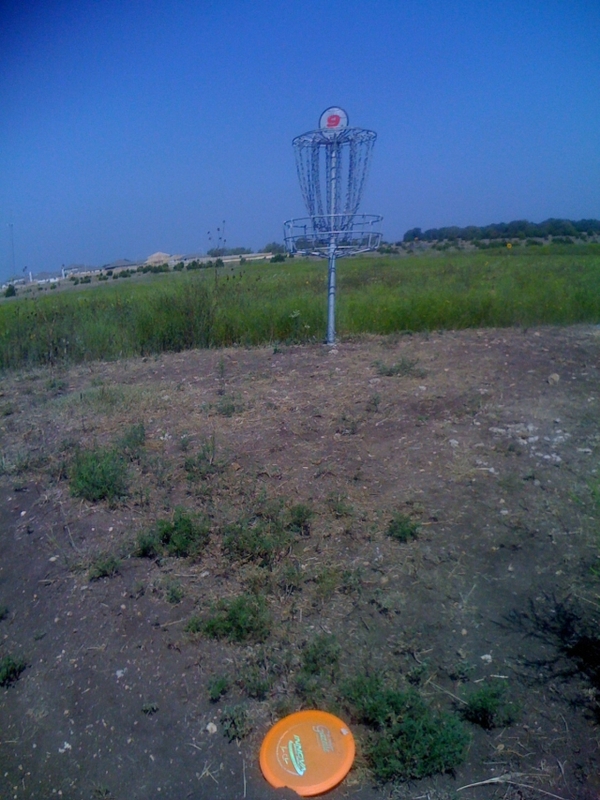 Hole 5 was rather tough because the out of bounds areas were not mowed down like it was for the rest of the course. Jon managed to narrowly miss throwing his disc in the lake. And I managed to get stung by a wasp. 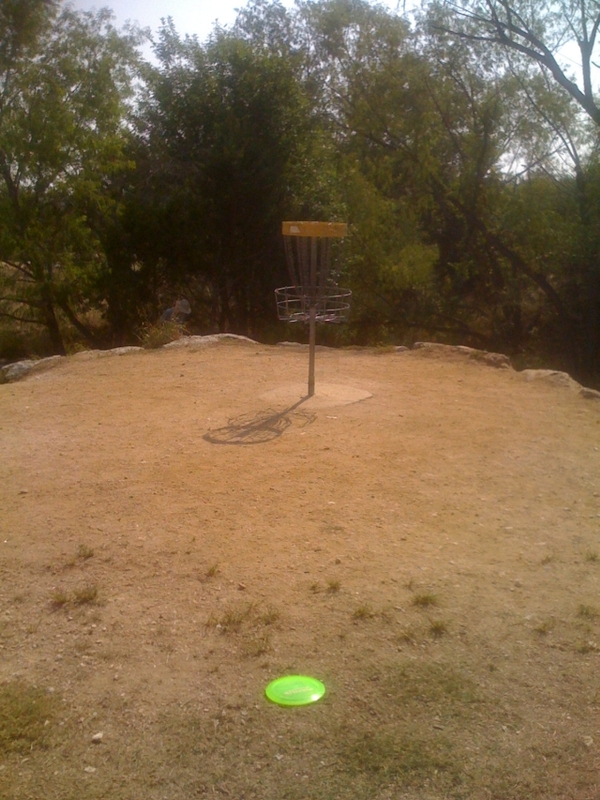 I did get a birdie on hole 9. But it was not that tough. The hole is only a short distance away and it is in a wide open field. 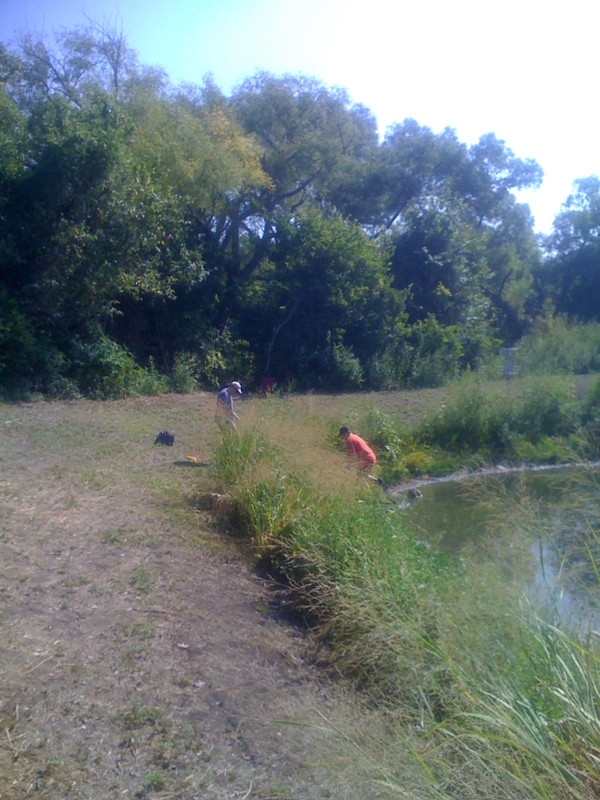 Hole 17 was not that hard with the severe drought that we have been through. The pond where you throw your disc over is completely dry. They have made one improvement to this course. They put concrete tubes that act as bridges where you have to cross water. But this course still needs a lot of improvement. There are no signs for the tees. And there are a couple of places where you can get confused as to where to go next. 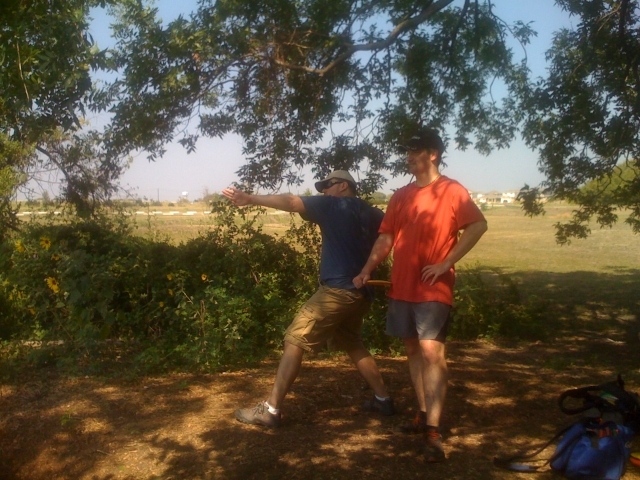 This entry was posted in Disc Golf on September 20, 2008 by Mark. On somewhat of a spur of the moment, I purchased a new car. I have been thinking about getting something different for a while now. So, when I realized that I needed to replace all four of my tires and brakes, I decided that it was time. If I bought a car now, I could avoid having to spend around two grand for new tires and brakes. I took a BMW 335i for a test drive. I liked the car. It was fun to drive: well balanced, responsive, and it telegraphed the road feel nicely. So I asked how much my trade in would be. They initially told me 12K. Which was disappointing. The blue book value for a trade in was 16K. But I eventually talked him into using 14K as the value. I also looked at Corvettes. There is some serious deals going on there. For a 2008 Black Corvette with the Z51 package, the MSRP was 62,140. They were offering employee pricing of 53,029. Nine grand off! They too offered me 14K for the trade in. There was only one car in stock with that type of deal, though. It was black and an automatic. While I have wanted a Corvette for a while now, I just don’t like their profile and how I fit inside them. The car is really low to the ground and relatively big. And I barely fit inside one. My head feels like it is dangerously close to the pillar and ceiling. Which is not a good thing since, in an accident, you are likely to go up and forward. The BMW has a lot of refinements to it. It is very polished and civilized for a car. I like the fact that the radio was made for the iPhone. It connects via an accessory cable to it. You can charge it and it will transfer the phone book contacts and music play list to the radio. And the radio also acts as a blue-tooth headset as well. The car key acts like a fob. You only need to carry it in your pocket to lock/unlock or start the car. The car also comes with free maintenance for four years. All costs are covered. I also learned that BMW offers an upgrade to the chip which controls the car’s computer. This upgrades the car’s horsepower rating from 332 to 384 and the torque from 325 to 421 lb/ft. Even better, the warranty is not invalidated. It is fully supported by BMW. When I asked that they throw in the chip for free (a 2500 value), the salesman immediately agreed. Damn. That was too easy. I wonder else I could have got. But it was enough to tip the scale towards buying the vehicle. It also helped that BMW was offering 0.9% financing. Looking back in time, I paid $19075.72 in October 2003 for my F-150 Lightning which included TT&L. The MSRP was $33,310.00. I traded it in today for $14,000. Which meant that I only lost 5 grand? But the cost to me included my previous trade in. So I don’t think that would be a good way to remember my truck’s value. But it is better than the 19 thousand dollar loss (33K-14K). While my vehicle is a limited edition version (only 2500 were made), Ford makes a billion F-150s. And it probably hurts that my truck is only a two seater. My total gas cost over the lifetime of the Lightning was $9126.50. My total maintenance cost was $3060.77. And the insurance cost was $6957.00. Over the 59 months of ownership, that makes it $324.48 a month to operate. Which seems like a lot of money. This entry was posted in Interesting on September 15, 2008 by Mark. This entry was posted in Web links on September 14, 2008 by Links. Jon and I played at Wilco today. And it seems that there was a little bit of preparation for the upcoming Outlaw Singles Shootout. 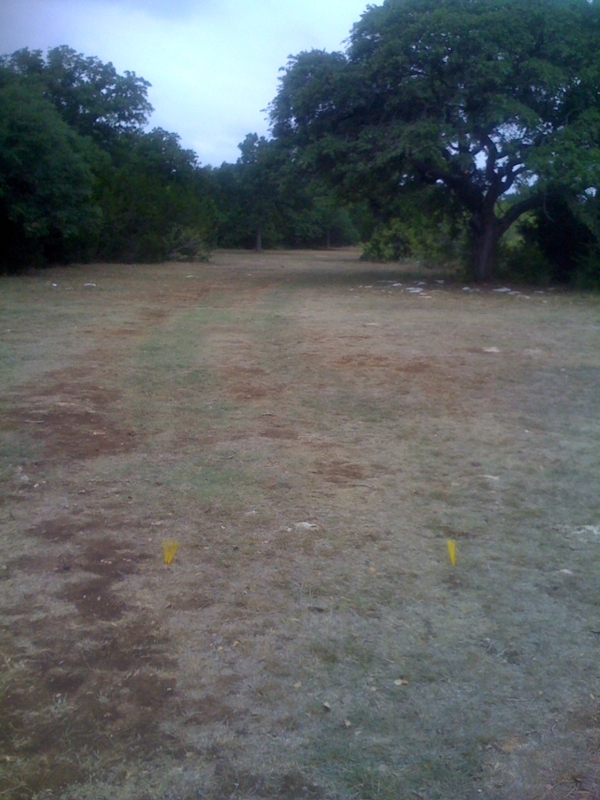 There were temporary tee boxes on holes 3, 4, and 10. 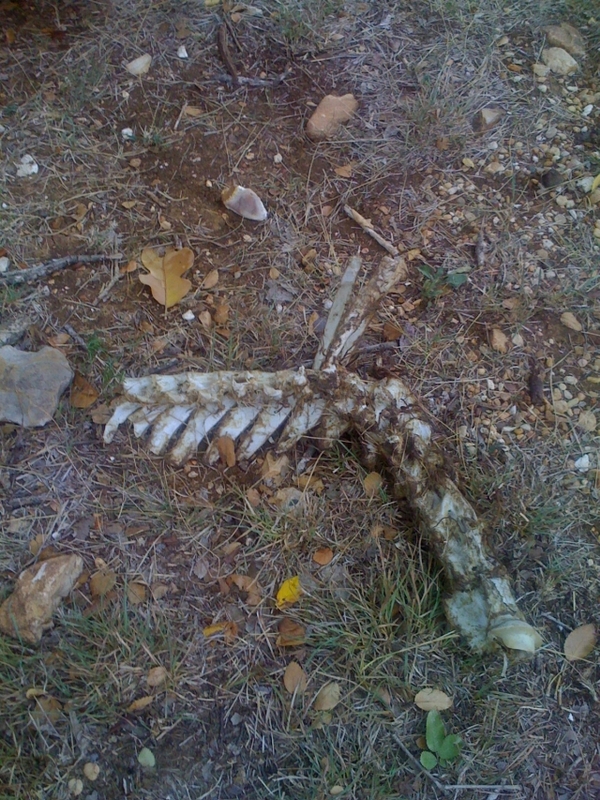 We came across some bones. Which were part of a vertebral column. Who knows what creature it came from. Or what ripped it up. After the round, we stopped at Chuy’s for lunch. 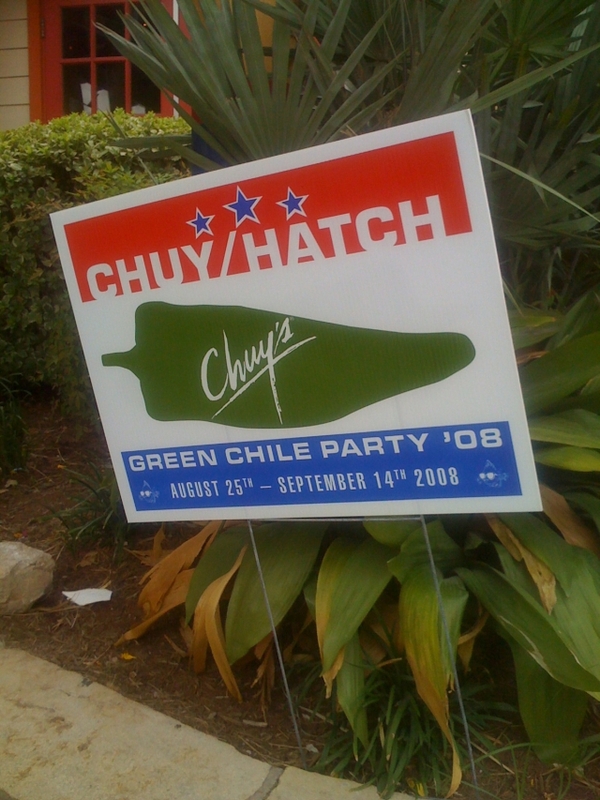 The Green Hatch Chile festival was still going on. They had a cute tie in with the presidential elections. 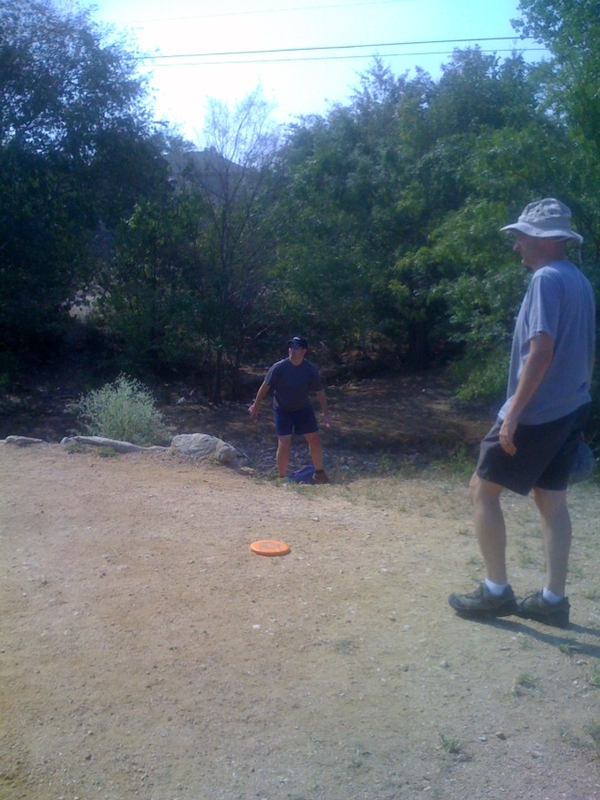 This entry was posted in Disc Golf on September 13, 2008 by Mark. It seems that another month has gone by. And we don’t have a pesky hurricane to ruin it either. Ike moved east and completely missed us. 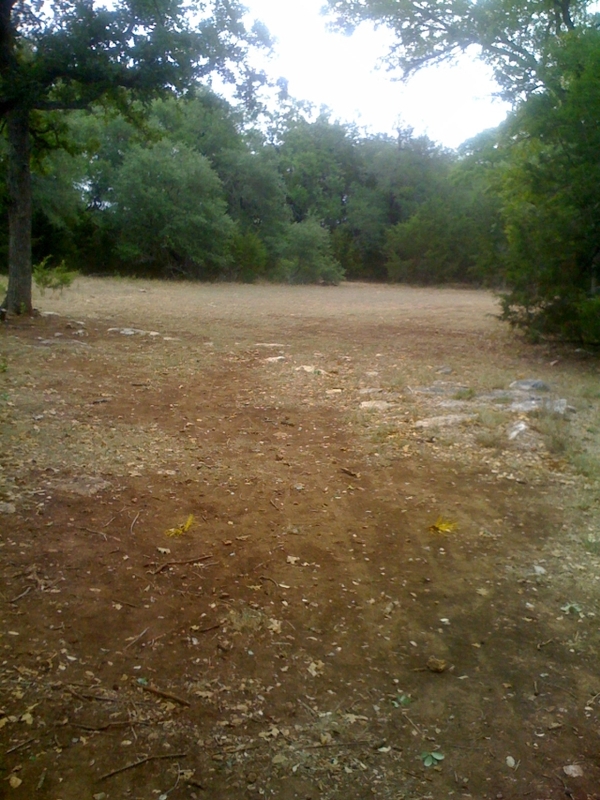 Not a drop of rain hit the ground around here. Which is sad. We desperately need the rain in this drought. Mike bought a new DM screen. Which he was happy to display. And Joe bought some appropriate candies: Mike and Ike Tropical Typhoon flavor. Ike did give us a good show during sunset. The colors were beautiful. We slowly worked our way deeper into the dungeon. And we all gained another level (to 3). I was luckily enough to find a magical wand of Witch Fire. I need the bonus help on hitting monsters. Our new NPC, Brother Tanaka, is a Warforged Paladin and he is very helpful. No close calls this night. Although the dice was rolling poorly for Jon. He rolled 6 critical fumbles! Amusingly, one of the minions rolled a critical fumble and caused him self a couple of hit points. Which was enough to kill it! This entry was posted in Dungeons and Dragons on September 12, 2008 by Mark.